Members of the European Parliament have condemned Google's role in encouraging children to pester their parents about EU copyright legislation that the corporation fears will hurt its profits. YouTube's most recent campaign against Article 13 of the EU's Directive on Copyright in the Digital Single Market, which would make the platform liable for copyrighted material, has induced young YouTubers, some with large followings, to believe the video site will disappear next year. A Wikipedia-style popup about the perceived consequences of Article 13 appears each time a user first lands on the homepage for the day. All this appears to have inspired, in an extreme case, one German teenager to threaten suicide. In a segment shown by German public broadcaster ZDF, she vows: "They can't steal our future. If they close it – so many suicides – I will be the first." "Don't fool the kids and their parents," responded Green MEP Hegla Trudel. She urged YouTube not to create an atmosphere of "hysteria". The belief among teenagers that YouTube is closing is a strange one – a landmark in public policy lobbying – so we need to explain how we got here. The change to copyright legislation passed by the European Parliament in September would oblige Google to consider using technical measures to ensure copyright takedown requests are respected, and clips "stay down". Google enjoys special privileges under UGC (user-generated content) provisions not granted to rival music services like Apple and Spotify, which must license music first before distributing it. Copyright groups argue that loophole depresses the market price of music. YouTube pays around 1/20th of the rates Spotify does. But Google's response to Article 13 has already been controversial. In the summer, campaign groups linked to Google via its registered lobbyist N-Square deluged MEPs with bot-generated email traffic and social media messaging. Each MEP received around 60,000 emails protesting the change, something not mirrored in the real world. Street protests against Article 13 mustered only a handful of supporters. In Stockholm, just 12 attended the vast space set aside for the protests, noted software developer Volker Rieck who has covered the campaign for newspaper Frankfurter Allgemeine Zeitung. In Lodz, six policeman outnumbered just four "digital rights" activists. Bots & Death Threats towards MEPs. Parliament passed the amendments – part of the Digital Single Market reform package – but Google wasn't done. As the wording of the directive was being finalised, Google ramped up the rhetoric, turning the YouTube channels against European institutions. On 22 October, YouTube CEO Susan Wojcicki, one of the first Google employees, made a video and public blog post threatening that many channels would need to go next year. 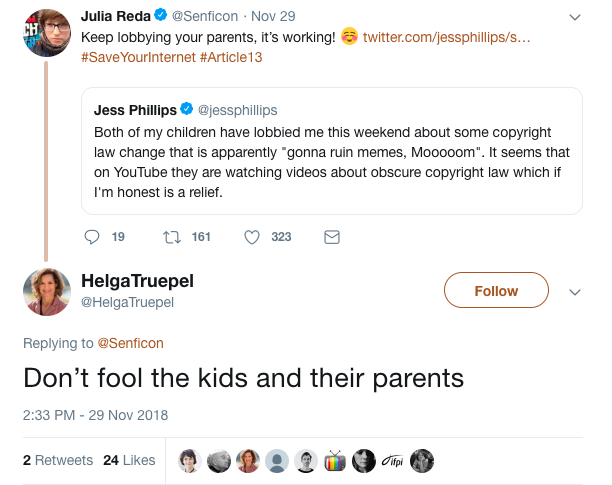 She claimed Article 13 would "shut down the ability of millions of people" to upload videos, and effectively take content off the air in Europe. Wojcicki urged: "Please take a moment to learn more about how it could affect your channel and take action immediately. Tell the world through social media (#SaveYourInternet) and your channel why the creator economy is important and how this legislation will impact you." For more detailed images, click here and here. "This was very subtle," Rieck told us. "YouTubers came up with one dystopian video after another." Since YouTubers have huge teenage audiences, this gained an enormous reach, ultimately escalating into the suicide threat you can see above. 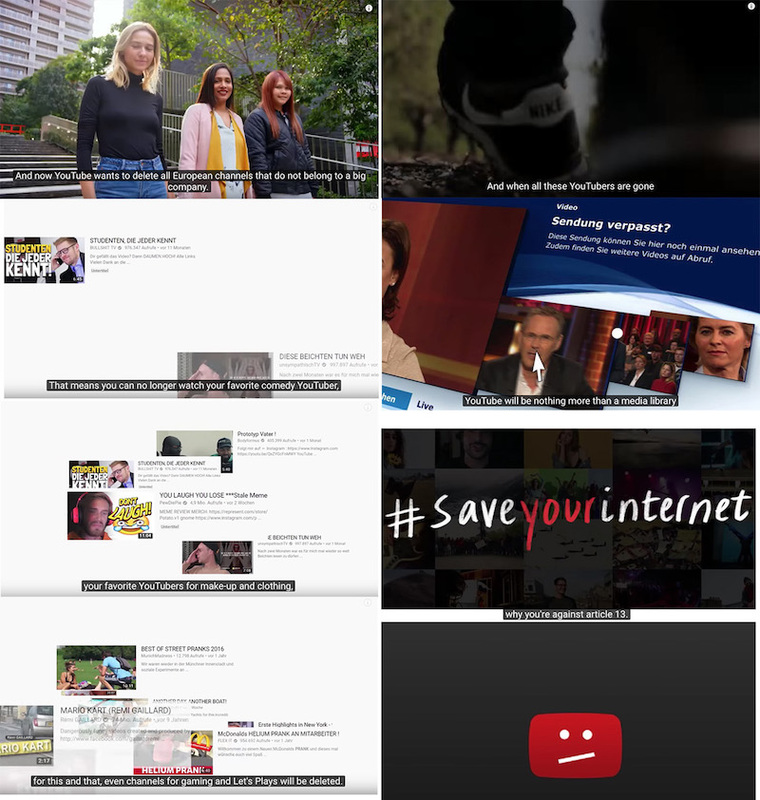 UGC sites like YouTube enjoy their privileges largely because they promise not to organise or arrange content they host – the legislation was designed for services like cloud storage. That's why regular YouTube doesn't host radio or human-curated playlists. But miraculously, the political videos sympathetic to Google's corporate interests began to rise to the top. "Three out of the top five trending videos were anti-Article 13," Rieck said. One example can be viewed here. The video is slick messaging, predicting that gaming, makeup and hobby videos will all disappear, and that uploading will be prohibited. Thanks to YouTube's promotion, it has gone viral, gathering 3.8 million views and over 50,000 comments. Others refer to the "EU Congress", an institution which does not exist.